St. Martin's Press, 9781250125484, 368pp. “Music is the reward for being alive,” writes Jorma Kaukonen in this candid and emotional account of his life and work. 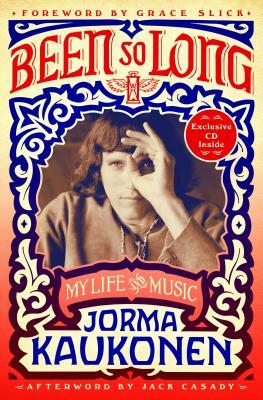 “It stirs memory in a singular way that is unmatched.” In a career that has already spanned a half century—one that has earned him induction into the Rock & Roll Hall of Fame and a Grammy Lifetime Achievement Award, among other honors—Jorma is best known for his legendary bands Jefferson Airplane and the still-touring Hot Tuna. But before he won worldwide recognition he was just a young man with a passion and a dream. JORMA KAUKONEN has been one of the most highly respected interpreters of American roots music, blues, and Americana, and at the forefront of popular rock 'n roll. He is the founding member and guitarist of two legendary bands, Jefferson Airplane and the still touring Hot Tuna. He is a member of the Rock & Roll Hall of Fame and a Grammy nominee. In addition to his work with Hot Tuna, Jorma has recorded more than a dozen solo albums. Jorma and his wife Vanessa operate Fur Peace Ranch Guitar Camp, one of the world's most unique centers for the study of guitar and other instruments.